I know, I know, somehow things will turn out all right and everything will be worth staying up till 3am to do. I think I might have an underlying desire to be a party planner and it sounds weird but I kind of dig the fun, thrill and anxiety of the preparation process. 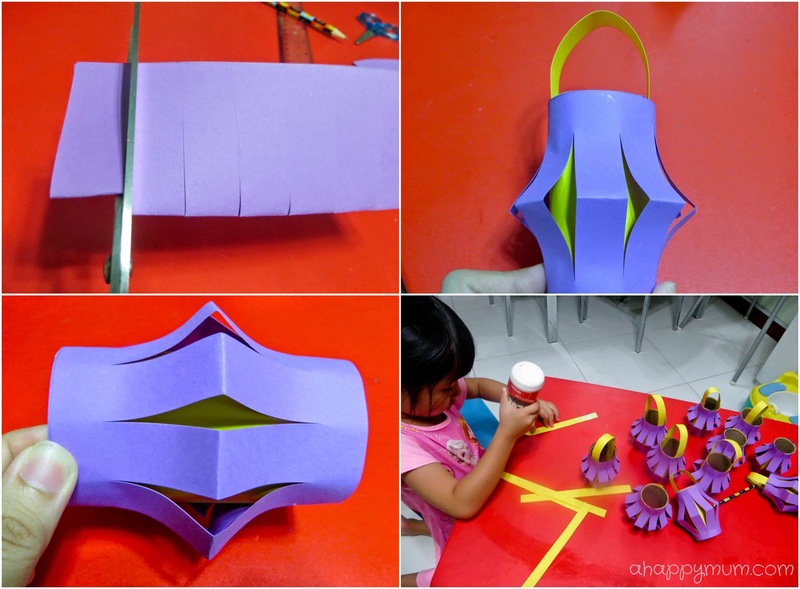 Anyway, in today's Creativity 521, I'm sharing with you the Rapunzel Themed Wall Decorations that we made! Yes, I do mean we, because the kids played a part too. Now, isn't that awesome? I never did feel that you need to buy a banner as a party decor (right, our house is pretty small anyway and it's not like we have a garden or porch) and it is not that hard to come up with some simple decorations to jazz up the wall or the house. Moreover, you can design them in any theme you like too. Ta-dah! So here is how our living room wall looks at the moment! Do you like it? It's not that fanciful but yet good enough to brighten up the house and get us in the party mood! 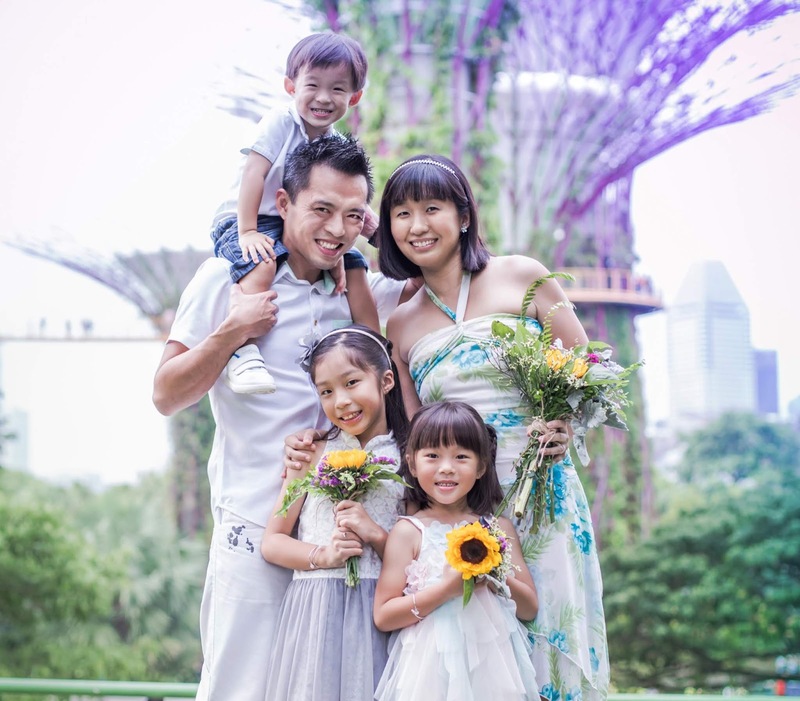 Firstly, I'm sharing with you this simple method to create and print out the name of your child using pictures of his/her favourite character or theme of the party. -> Go to Powerpoint and enter the letters of the name with one letter on each slide. I used the font Cooper Black, size 600 but this is all up to you. Tip: For the picture to look proportionate or to fit nicely into the shape of your letter, you might need to crop it beforehand. You might also try playing around with the offsets (left, right, top, bottom) till you achieve the best fit. 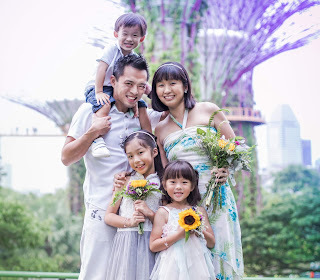 Next, print the letters onto photo paper, cut them out neatly and you have just created a personalised and uniquely designed name of the birthday child. I wanted a big number 5 on the wall but since my printer could only print out A4 size, I knew we were better off doing it on our own So, I decided to make something straightforward yet fun for the kids at the same time - a paper collage! Keeping in line with the theme colours of purple and yellow, we cut out strips of coloured paper and then into small square pieces. Even the little sister is getting good at cutting nowadays! I cut out a really huge circle from two pieces of vanguard sheets joined together and this would act as the base for the collage. Tip: I used a hoola hoop to trace out a perfect circle! After that, I drew the outline of a number 5 in the middle of the circle. Next, it was time to 'paint' with the glue! Oh yeah, this was their favourite part where they could get their fingers all sticky. We would paint a small portion of the base and fill it up with the paper bits, repeating this till the entire circle was covered. Tip: Be extra careful at the edges and layer some parts so that there is minimal empty space. To make the number stand out, we decided to make it yellow and let the background be purple. There! Our big 5! Just to give the purple background a little variation, I also used some of the metallic purple cards leftover from making the birthday invitations. I have to tell you this paper collage, though simple to make, took a longer time than I expected but seeing the end result, I think it was totally worth it. The hubby was complaining that I was stashing away so many toilet rolls that I decided one day to just take them out and use them (well, some of them) for the upcoming party. So, together with the kids, we made some simple lanterns to decorate the house. Firstly, cut off a small strip of the toilet roll till it is approximately 8.5cm in height. Next, cut out rectangular pieces of yellow (8.5cm tall) and purple coloured paper (10cm tall) and wide enough to go around the roll. 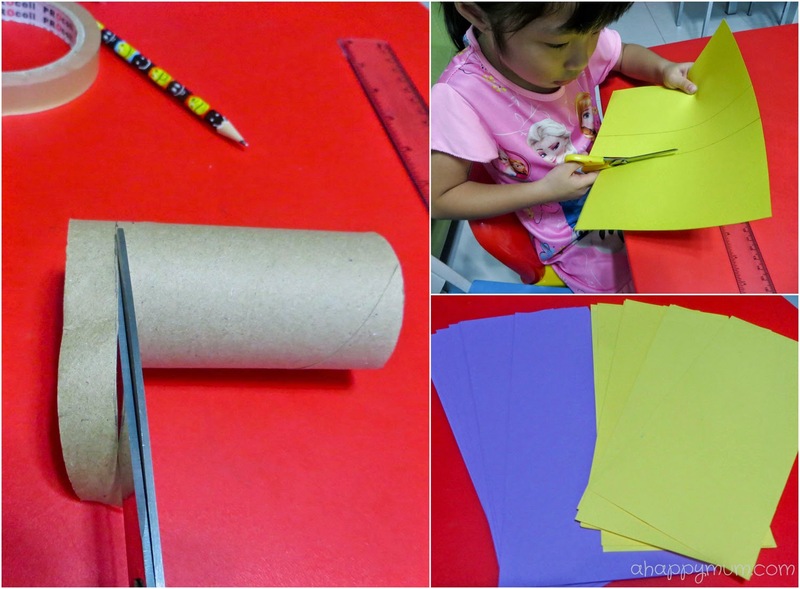 Apply glue along the border of the yellow paper, wrap and stick it around the roll. For the purple paper, fold it into half and cut vertical lines (1.5cm apart) as shown below, leaving a margin of 1.5cm at the top. Open it up, apply glue at the top and bottom and wrap it neatly around the roll. Since the purple paper is slightly bigger than the yellow one, the middle part will jut out nicely as shown. To make the handles, use a yellow strip, glue at the ends and stick it on the inside of the roll. Yay! Toilet rolls are transformed and used up! 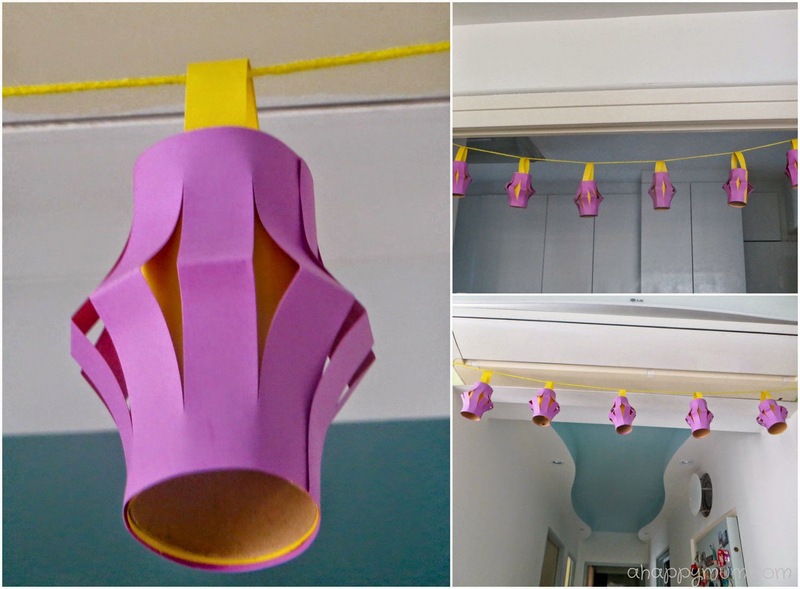 To hang these up, we used yellow yarn to thread them and secured using a big ball of blu-tack at each end. Nice? Last but not least, this was a craft project that I did on my own while the kids were asleep. If you have watched Tangled, you would know about the beautiful sun symbol seen in Rapunzel's kingdom so I really wanted to replicate these in our house. The thing is, the symbol might look simple from far yet intricate when you look closely because of all the lines and curves involved. Well, I do not have a sun puncher and I did not want to simply print out my bunting and waste lots of coloured ink, so I decided to go the traditional way and took out my craft knife which had been sitting in the craft box for a long time. 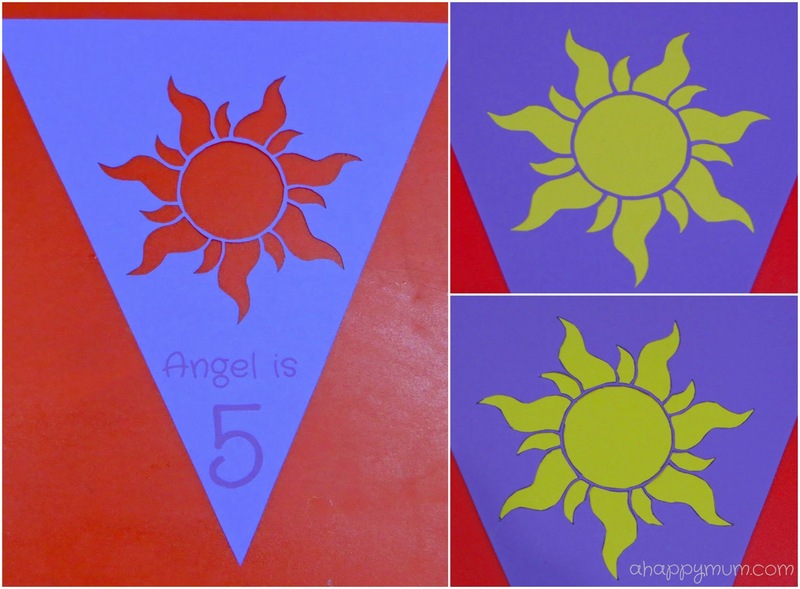 Firstly, I downloaded the outline of the sun symbol here and did a simple design in Photoshop to personalise the bunting for Angel. Next, I printed out the sun symbol on one side and the text on the other side as shown below. 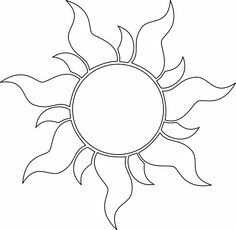 This is so that the outline of the sun will not be seen after I have cut it out, which I will illustrate later on. I wanted the flags to be triangular in shape and so I measured and marked them to be consistent before I cut them out. Then comes the most time consuming part - the cutting of the sun! I bought this craft knife in Sweden previously when I was doing the Eiffel Tower pop-up card for the hubby and even though this sun can be considered much easier, the thing is I had to repeat and do it over and over so I must say the fingers were really aching after that. Tip: Be extra precise and cautious when cutting out the circle so as to not break any thin adjoining parts. Still, I think they made a huge difference to the wall and given a choice, I would still do them all over again. Below is how the flag will look when the sun has been fully cut out. Just to show you why I printed the sun on the reverse side, see the two pictures on the right below and you can see that the top one has no outline seen while the below one has a 'leftover' outline after cutting if printed on the same side. Yes, perfectionist at times, I know. To make the sun yellow, I cut out a trapezium from a yellow paper that fits into the flag and used it as a template to trace out the rest. Apply glue along the border and stick it on the back of the purple flag. There! All done! I'm really proud that the sun symbols turned out looking really beautiful and exactly like the ones we saw in the movie. To make it into a bunting, I used double-sided tape at the reverse top of each flag and a ribbon to string them together. Tip: Make sure the flags are more or less equally spaced apart. To hang them up, I used blu-tack on the top corners of every flag and stuck them onto the wall. Lastly, just to spice things up even more, we also added in Rapunzel, Pascal and of course, the floating lights. Now, what do you think of our wall? I smile every time I look at it and I am happy knowing that the girls played a part in making them and that my beloved firstborn is turning a year older very soon. For more party craft ideas and DIY tutorials, visit my gallery here. Wow! Everything's so awesome! I especially like the lanterns, the sun shape cut-outs, the powerpt letters, the big 5... okie it's everything :) Happy birthday to Angel in advance! Can wait to read about the actual party. I love the idea of getting the children to help out with the party decor! This is so cute and colourful, the bunting looks incredibly professional too, you wouldn't believe that it was home-made!